Always consult with your veterinarian before making adjustments to your dogs exercise habits and food regimens. It is crucial to provide your dog with proper diet and exercise as a puppy. A puppy's health often directly influences its size and heath later in life. 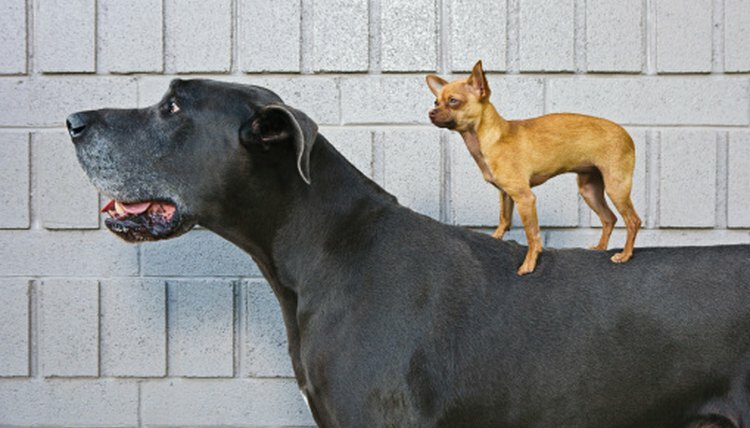 Research your dog's breed to better understand its ideal weight and size. The normal height and weight for a dog varies drastically between breeds and the age of the dog. The most effective way to make your dog grow is to feed it more. Parasites are a very common cause of weight loss or a lack of weight gain in dogs. A vet can run simple tests to diagnose parasites and they can often be easily treated with medication. If your dog does not have parasites, adjust the amount you feed it until it reaches the ideal body condition. Follow a specific nutrition plan after discussing size concerns with your veterinarian. Measure every serving of food that you give to your dog, instead of guessing, so you remain consistent. Feed your dog balanced and nutritionally complete foods. If your dog needs more calories, be sure those calories are coming from healthy foods instead of treats. Feed your dog enough to sustain its physical activity. Talk to your veterinarian so that you can provide your dog with enough energy to complete its daily exercise regimen.